'Bam' - (Richard Tasco, R. 2017). Seedling 08-MDB-03-09-RE. MDB, 7.5" (19 cm), Early Midseasosn bloom and rebloom. Standards blue-violet (RHS 88A); style arms cream, blue-violet along ridge, blue-violet crests; falls black-violet, slight blue-violet at petal edge, some white veins near top of beard deep in throat; beard golden yellow in throat and middle, ends wisteria blue (92B); lightly ruffled; slight sweet fragrance. Seedling 04-SDB-07-33: ('All That Magic' x seedling 99-SDB-29-05: ('Replicator' sibling x 'Replicator')) X seedling 06-SDB-20-06: (seedling 03-SDB-11-18: (seedling 00-SDB-20-01: ('Buttonwood' x seedling 97-SDB-05-33: (seedling 94-05: (seedling 91-56-10: ('Wake Up' x 'Bisbee') x 'Wizard’s Return') x seedling 94-04-HR: (seedling 92-04: ('Auroralita' x 'Sam') x self))) x seedling 96-SDB-22-49: (seedling 93-03: (seedling 91-62: ('Pal Sam' x 'Auroralita') x sibling) x seedling 94-18: (seedling 91-53: ('Nimble Toes' x 'Pal Sam') x 'Toy Clown'))) x seedling 02-SDB-01-12: ('Love Unlimited' x 'Yearling')). Superstition 2017. 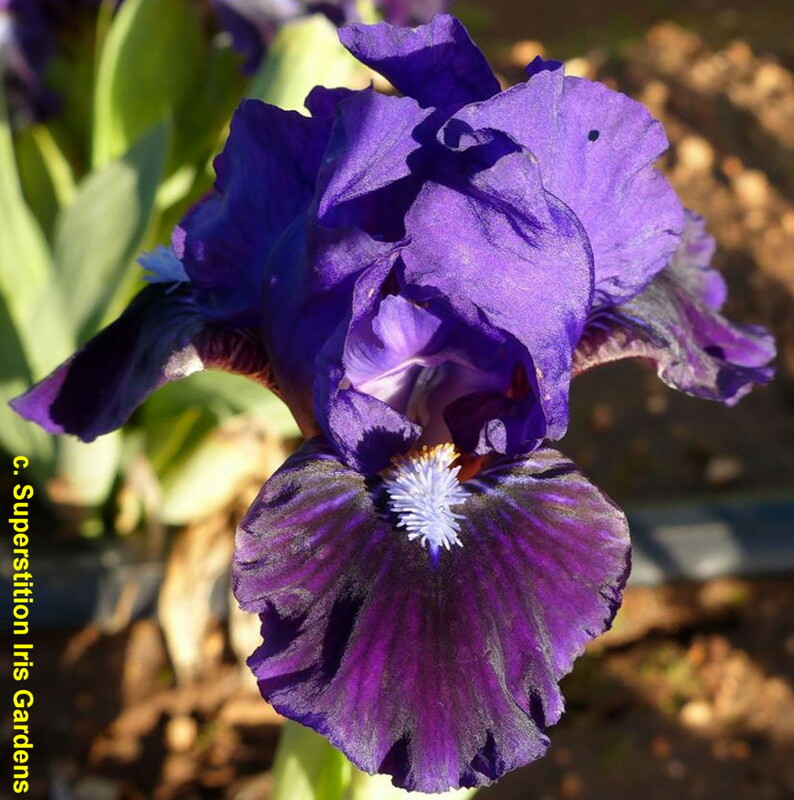 From Superstition Iris Garden 2017- BAM (Tasco 2017) MDB, 7 1/2", EM/RE. Seedling 08-MDB-03-09-RE. Our very first minature dwarf introduction! Blue violet standards; blackish violet falls, slight rim of blue violet, some white veins deep on throad of falls. Golden yellow beard tipped wistaria blue. Decent rebloom here in zone 8 climate. 04-SDB-07-33: (All that magic x 99-SDB-29-o5: (Replicator sib x Replicator)) X 06-SDB-20-06: (03-SDB-11-18: (00-SDB-20-01: Buttonwood x 97-SDB-05-33: (94-05: (91-56-10: (Wake Up x Bisbee) x 94-04-HR: (92-04 selfed))))) x 02-SDB-01-12: (Love Unlimited x Yearling). $13.00.